Kohl's stores are stocked with everything you need for yourself and your home - apparel, shoes & accessories for women, children and men, plus home products like small electrics, bedding, luggage and more. Cash Back is not available on each jewelry item with original price of $2,000 or greater, Kohl's Care, KitchenAid, gift cards and e-gift cards. Cash back is not available when using Masterpass or Visa Checkout. 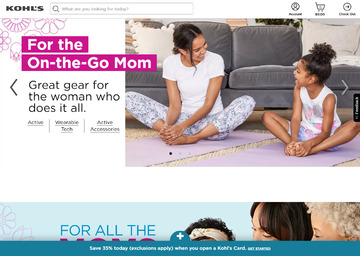 Click a Coupon or click Start Shopping to earn 2% Cash Back at Kohl's.